Lots of interesting discussion on various blogs and forums. 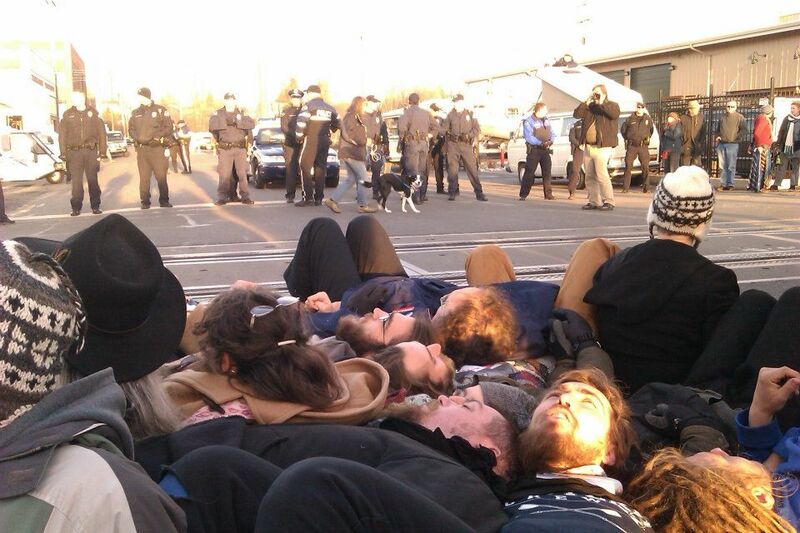 On December 12, several folks tied themselves together across the BNSF tracks coming through Bellingham. This led to the first arrests, that I know about, which were associated with the Occupy Bellingham movement. This group is often now referred to as "The Bellingham 12." This protest took place on a day of action all up and down the west coast blocking things like port facilities. I wasn't part of that protest, myself, but I know at least one of the people who were. It got people talking and blogs are humming with discussion. Folks keep asking, what is the proper focus for the Occupy Wall Street movement? There's the concern about unfair distribution of wealth; the so called 1 percent versus 99 percent issue. Other concerns are related, but all the issues have their differences as well. This protest had a lot to do with environmental issues, rather than just the income distribution problem. Here in Bellingham, there is a lot of opposition to SSA Marine's proposal to build a large shipping port north of town. The new port would ship coal and some other bulk products, such as grain. Some coal trains are coming through now to an existing port just across the border in Canada. There is fear that more coal trains will come if the new facility is built on this side of the border. Big worries about the environment and global warming; thus the protest at railroad tracks. Coal would be exported to China and other places which burn it for power. This issue points out a difficulty in expecting there to be one focus in movements such as Occupy Wall Street. The proposal to build a coal port is actually supported by a lot of union people. Union folks are thinking about the hundreds of permanent jobs that could be created by the port, plus many more temporary jobs created by its construction. On the other hand, union folks are supposed to be one of the constituencies of Occupy Wall Street as workers are said to be concerned about the American middle class being gutted while the 1 percent accumulate more wealth. Can those causes of saving the American middle class and protecting the environment cohabitate? That question is especially important in Occupy Wall Street because of the democratic structure of the movement where a lot of interrelated concerns are brought to the table. The movement often takes whatever form people bring to it. It can be said that democracy is one of the worse ways to get anything done except it's better than the alternatives. What direction does Occupy Wall Street or Occupy Bellingham take? To some extent, it is what ever the people bring up from the grass roots. Back to the question of whether the middle class and the environment can cohabitate; this is worth a lot of thought. Much of middle class lifestyles, in the past, have not been very good for the environment. Excessive driving, for instance. Part of the reason why China is such a big market for coal is the fact that it has 1.3 billion people. Many of them are aspiring to more middle class lifestyles. Seems like large middle classes and the environment can only be compatible if a lot of change takes place. Change in business practices, change in technologies and change in lifestyles. It all kind of fits together in the discussion of how to get from here to the so called nirvana of a green economy. Technology can be a big part of the change. I'm a fan of bicycling, but I even realize that the future may hold things like hydrogen powered cars. Clean energy will require technological advance. Some ask if China, where much of the coal would go, is doing anything to make it's economy more green. Apparently it is. China is big in solar, wind and other green technologies. It's just big in traditional technologies, such as coal, as well. 1.3 billion people is a lot of consumers. One can say that China is running on all cylinders; to borrow a phrase from the internal combustion engine. So, were people like my friend who was part of that protest blocking the railroad track helping the cause of Occupy, what ever that cause is? I guess the answer is unclear. At least this action stimulated a lot of discussion. It's another part of a big conversation about what the best pathways are to the future.